Welcome to the Powell150 education and outreach site! 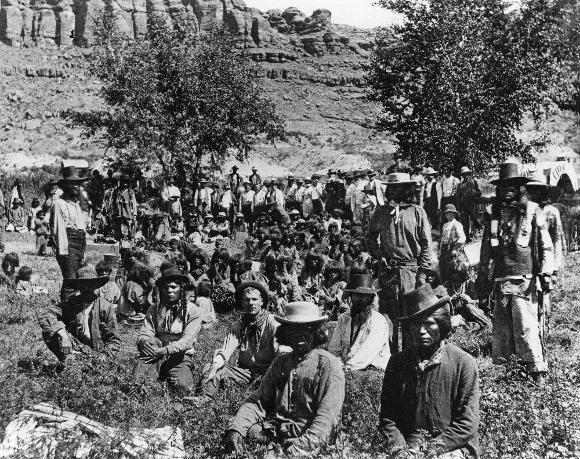 Bookmark the page now and check back soon for additional resources and information about upcoming events related to the 150th anniversary of the 1869 Powell Expedition. Colorado Statewide basin-filled map April 1, 2019 via the NRCS. Statewide Basin High/Low graph April 1, 2019 via the NRCS. South Platte River Basin High/Low graph April 1, 2019 via the NRCS. San Miguel, Colorado, Animas, and San Juan Basin High/Low graph April 1, 2019 via the NRCS. Arkansas River Basin High/Low graph April 1, 2019 via the NRCS. Upper Colorado River Basin High/Low graph April 1, 2019 via the NRCS. Laramie and North Platte Basin High/Low graph April 1, 2019 via the NRCS. Gunnison River Basin High/Low graph April 1, 2019 via the NRCS. Yampa and White Basin High/Low graph April 1, 2019 via the NRCS. Upper Rio Grande River Basin High/Low graph April 1, 2019 via the NRCS. And here’s the Westwide basin-filled map for April 1, 2019 via the NRCS. Westwide SNOTEL basin-filled map April 1, 2019 via the NRCS. 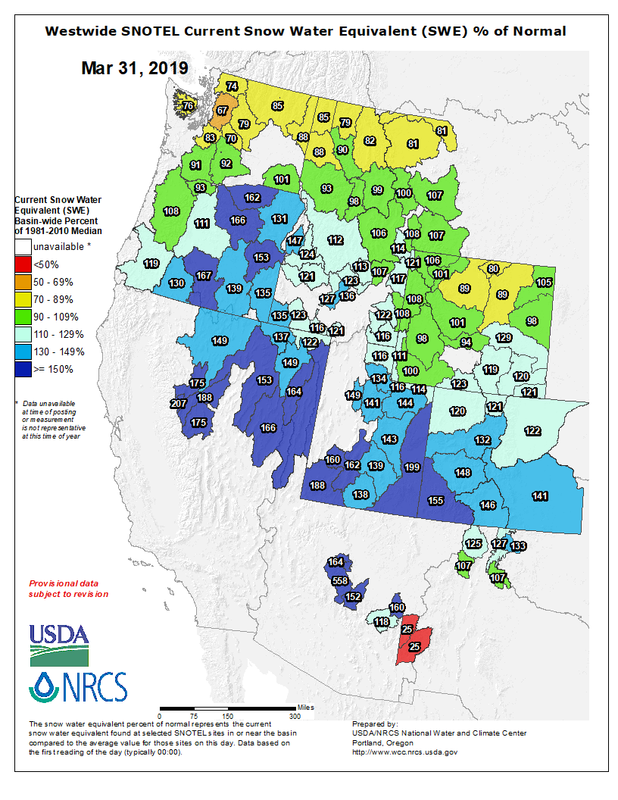 And just for grins here’s a gallery of early April snowpack maps from the NRCS. Statewide snowpack April 3, 2018 via the NRCS. Statewide snowpack basin-filled map April 4, 2017 via the NRCS. Statewide snowpack map April 10, 2016 via the NRCS. 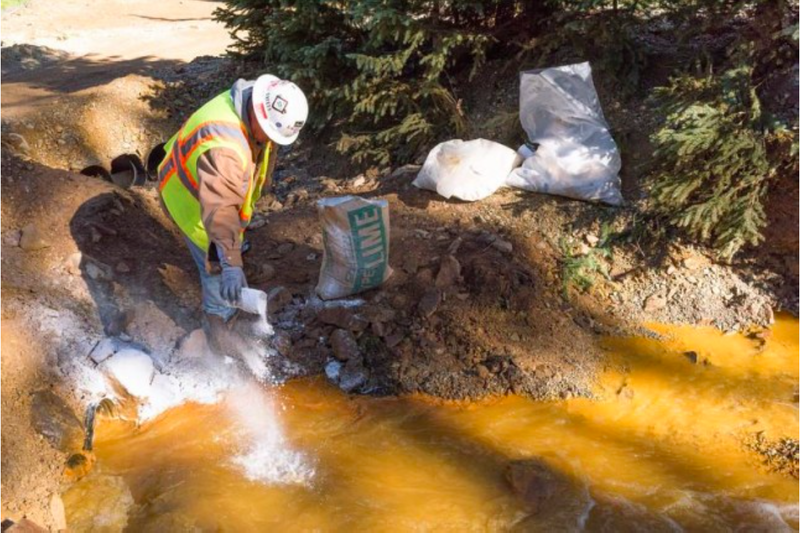 Officials will hear confirmation from the county’s emergency management manager on Wednesday that contaminated water recently released from the Gold King Mine did not adversely impact water quality downstream in the Animas River. San Juan County Emergency Manager Mike Mestas will speak about the mine’s status in his presentation to the San Juan Water Commission during its monthly meeting at 9 a.m. Wednesday at the San Juan Water Commission Office Building, 7450 E. Main St. in Farmington. Westwide SNOTEL basin-filled map March 31, 2019 via the NRCS. Though having a lot of snow is generally good for the water year, the type and timing of the snow also impacts the western cycle of water. “It’s not just amount of snowpack we have that is critical, it’s also the type of precipitation we’re receiving, especially in the winter — whether we’re getting rain or snow,” said Orla Bannan, in a Yampa Valley Sustainability Council Talking Green event. Bannan works with water scarcity as strategic engagement manager for the conservation organization Western Resource Advocates in its Healthy Rivers Program. Springtime has sprung earlier and earlier in the Yampa Valley, according to data from the Natural Resources Conservation Services’ snow telemetry sites. Snowpack is reaching its peak and melting off earlier in the season. Dust on snowy, windy and sunny days can all increase how quickly snow melts off the mountains. When that early snowmelt runs off into the streams that feed into the Yampa and Elk Rivers, the rivers also peak earlier. This has impacts to everyone who uses Yampa water. When the river peaks early, flows can rush by before producers’ crops are ready to use them. The river level appropriate for river recreation in town can fall by early summer, closing the river at the hottest time of the year when many would like to be paddling, fishing or tubing down it. When flows are low, the river is also more likely to warm to temperatures that are unhealthy for trout and other aquatic species. These changes are forecasted to continue, largely driven by warming global temperatures as human impacts continue to create a hotter atmosphere, according to the 2019 National Climate Assessment, a report authored by several federal agencies and reviewed by members of the National Academy of Sciences. Across the West, states with water cycles reliant on snow are seeing smaller snowpack, with a greater decline at lower elevations, Bannan said. Higher temperatures also intensify droughts as more water evaporates from streams and both crops and wild plant species use more water to grow in hot sun. One good year is not enough to mitigate the impacts of a decade of dry years, Bannan said. Locally, Routt County was only pulled out of drought conditions last week, according to the U.S. Department of Agriculture’s Drought Monitor. Before snowmelt hits the streams, it will first soak into dry soil. While snowpack is above average, river forecasters are still predicting near-average flows in the Yampa. As of Sunday, snowpack in the Yampa Valley contained 125 percent of its normal snow water equivalent, according to the NRCS, but the National Weather Service is forecasting flows in the Yampa River in April through July to be much closer to average — 91 percent of average at Stagecoach Reservoir and 100 percent in Steamboat Springs. The Yampa is also part of a much larger watershed, flowing into the Green River and then the Colorado River, and then into Utah, Arizona and Mexico. Colorado is legally obligated to send a portion of its water — including Yampa River water — to downstream states in the form of an annual contribution to Lake Powell. In recent years, below average water years have increased concern that Colorado won’t contribute enough water to Lake Powell to meet its legal obligations. Should that happen, an interstate call would be administered, requiring water users in Colorado to reduce use to send more water downstream to meet its obligations. Just as upcoming flows in the Yampa are predicted to be slighter than its snowpack, flows in the Colorado River are predicted to be slighter than its snowpack, meaning the state needs several more good years to soothe water managers worries for Lake Powell. 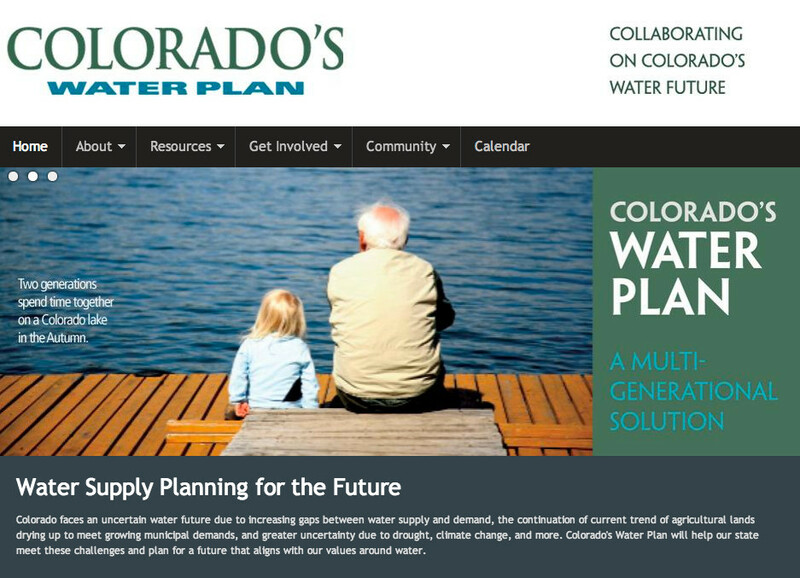 Statewide, water managers are working to plan how to divvy up water should Colorado be required to curtail water use due to an interstate call. On the Yampa, the city and other partners are working to make the river more resilient to a changing climate. Kelly Romero-Heaney, water resources manager for the city of Steamboat Springs, explained programs to restore trees along the riverbanks will eventually help shade the river, preventing evaporation and temperature increase due to the heat from the sun’s rays. This will allow more of that water to make it downstream. The city has also partnered with the Colorado Water Trust to increase flows in the river, and a new endowed fund set to launch later this year will help fund river management in the future. “When it comes to the Yampa River, we don’t exactly know what to expect year-to-year, but we know that if we give the Yampa the ingredients it needs — like conserved lands, flowing water, restored riparian forests — then we’ve done the best we can do to at least help our rive buffer our self against the extremes we have coming our way,” Romero-Heaney said.